Found on the pages of The Chicago Tribune, these are just some of the events that occurred in Chicago on this date as the great city grew . . . The Railroad Gazette published two diagrams showing the movement of east-west and west-east trains during 1880, the tables showed conclusively that Chicago was the most important railroad center in the country. Chicago’s trunk lines received 1,513,986 tons of eastbound freight. Buffalo, New York received 1,031,792. The next closest Midwestern city was Peoria with 390,148 tons. 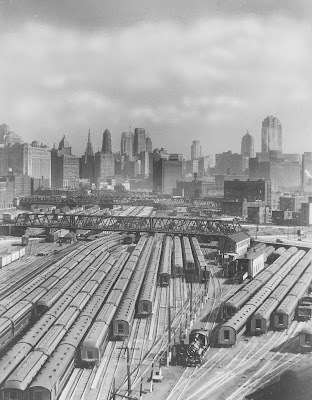 Traffic from the east also saw Chicago trunk lines handling three times as much freight as the next closest midwestern city. Chicago handled 346,582 tons while St. Louis saw 115,776 tons. Interesting article on this day about “How Policemen are Built”. The Tribune reported that Chicago had a police force of over 150 tons with a chest measurement of nearly one mile. These measurements were “unequally distributed” among 1,700 men. It’s a wonder they found anyone to join the force. Applicants were to have been Chicago residents for at least two years, qualified to vote, be able to pass a medical examination, and be not less than 5 feet 8 inches nor more 6 feet 4 inches in height. In 1890 there was just one officer on the force who reached the maximum height. The average policeman weighed about 180 pounds and had a chest measure of about 37 inches. Under the headline Men Who Make History it was announced that the first meeting of the Board of Directors of the World’s Fair was held at the Sherman House. At the meeting Edwin Walker was elected Temporary Chairman, Rollin A. Keyes was elected Temporary Secretary, and the directors who answered the roll call were H. H. Kohisast, C. L. Hutchinson, Ferdinand Peck, M. A. Ryerson, and Stuyvesant Fish. A committee composed of Owen Aldis, S. W. Allerton, and E. S. Pike was charged with making arrangements for permanent quarters for the committee. Another committee of five men was given the job of exploring ways in which the second installment of five million dollars could be raised for the project and directed to report their findings at the next meeting within a week. Later in this same issue the editorial board of The Tribune weighed in on the location of the fair. Apparently, the piece ran as a reaction to a proposal that the fair be a “fair of neighborhoods” with various sections of the city each hosting one aspect of the exposition. “Were the Fair cut up into chunks and scattered over the face of the city it would be a flat failure financially and in every other way. There would be few visitors to an exposition the fragments of which they would have to hunt in different points of the compass to find . . . Go to the great Barnum, the showman, and learn wisdom from him. He pitches but one tent, no matter how big it must be, and gathers all his attractions under it. 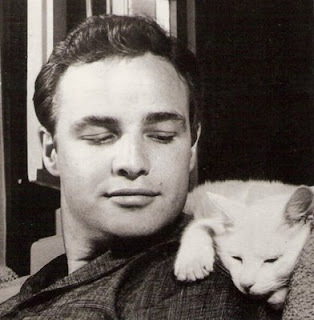 He does not put his menagerie in one part of the city and scatter his rings around other parts,” said the editorial. The piece speculated that the talk of such a “scattered” plan most probably stemmed from the fact that a majority of the Fair’s directors had “personal interests” which they worked for. Not such a bad guess, I’m thinking. The mind . . . not the pocket. That idea has been a tough sell in the Windy City. 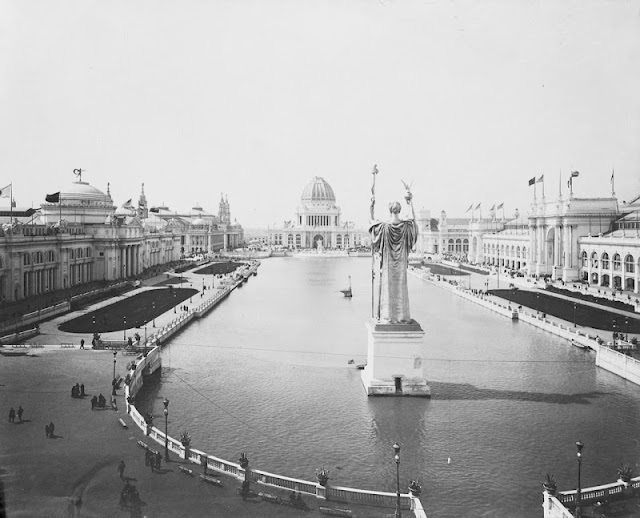 But in the cast of the 1893 World’s Columbian Exposition the sale got done. 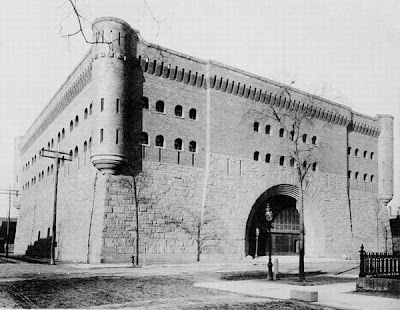 On this date ground was broken for the new First Regiment Armory which until 1967 stood on the corner of Sixteenth Street and Michigan Avenue. At 4:30 in the afternoon the First Regiment marched down Michigan Avenue with flags flying and drummers drumming. Ceremonial shovels were filled and then “the boys by companies had their chance. There was a quarter of an hour of fun. The boys fired the dirt over the wagon and under it, and at each other, and on the populace which stood grinning near by.” At five o’clock the regiment marched home again. The First Regiment Armory was erected in an interesting location. John Root designed the structure for Daniel Burnham’s firm, and it was built just blocks away from the houses of some of the most prominent members of Chicago society—Marshall Field, Potter Palmer, Phillip Armour, George Pullman and their peers. When the city erupted in labor strife after the Haymarket Affair of May 1, 1886 the prosperous members of Chicago society began to fear for a general uprising. They used a fair amount of their political pressure to get the armory built. It was a most impressive structure, but it’s gone now. It was torn down in 1967. The largest single draft of potential sailors ever processed through the Great Lakes Naval Training station came to Chicago on this date and marched through the loop to the tune of a marching band as they made their way east. The women’s section of the Navy League met the sailors at Northwestern station in 100 automobiles. Those who had no ride marched behind the cars and the Great Lakes Naval Training station band. The counsel for the Lincoln Park commissioners, William H. Beckman, opened negotiations today that would remove the obstacle to the outer drive link bridge. The move came after the approval of a $2,000,000 bridge bond resolution. Mr. Beckman said that one of the few things that stood in the way was the negotiation with the federal lighthouse department in Milwaukee that would exchange a piece of government property in the way of the proposed bridge for a nearby piece of city land. Following that the lawyer expected to initiate condemnation proceedings for property held by W. O. Green, president of the Chicago Canal and Dock company.